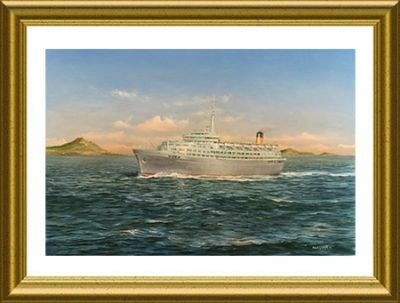 Every now and again a ship comes along, so revolutionary in style that it influences the design of ships for decades to follow, and the magnificent Southern Cross was one of those great ships. 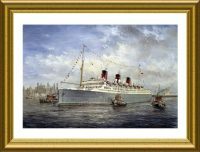 We asked Robert to try to capture not only the splendour of her unique design, but also the feeling of just what it must have been like for her passengers and crew to have sailed aboard her on one of her ‘around the world voyages’, which is exactly what Robert has managed to do. 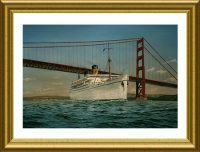 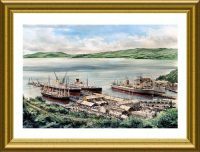 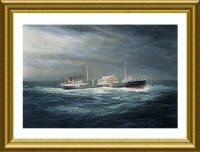 The size of this painting, framed in antique guilt is 29″ X 36″ inches and is featured on the front cover of “Ships to New Zealand (Part 5)” in the Great Liners Video series.